Some years I have no desire to dip into the kids’ Halloween candy and other years I can’t help myself. This year happens to be a can’t help myself year. I was indulging a little too much and I knew I need a strategy to lure myself away from the kids’ halloween candy and still satisfy my sweet tooth cravings. So I made myself a semi-healthy (but still chocolate covered) high protein snack. Chocolate and peanut butter, and to be specific, dark chocolate and peanut butter, is my all time favorite dessert combination. I could never resist Reese’s Peanut Butter Cups as a kid. Unfortunately they are made with milk chocolate and I’ve been dairy free for a while now so that’s pretty much off the table. These days high on my list are peanut M & Ms and the more rare-to-find-in-a-Halloween-basket, peanut butter M & Ms. If you’ve ever peeked at the ingredients list you know these aren’t the healthiest indulgences on the block. I was searching for an alternative with all natural ingredients that satisfied my craving for chocolate and peanut butter. 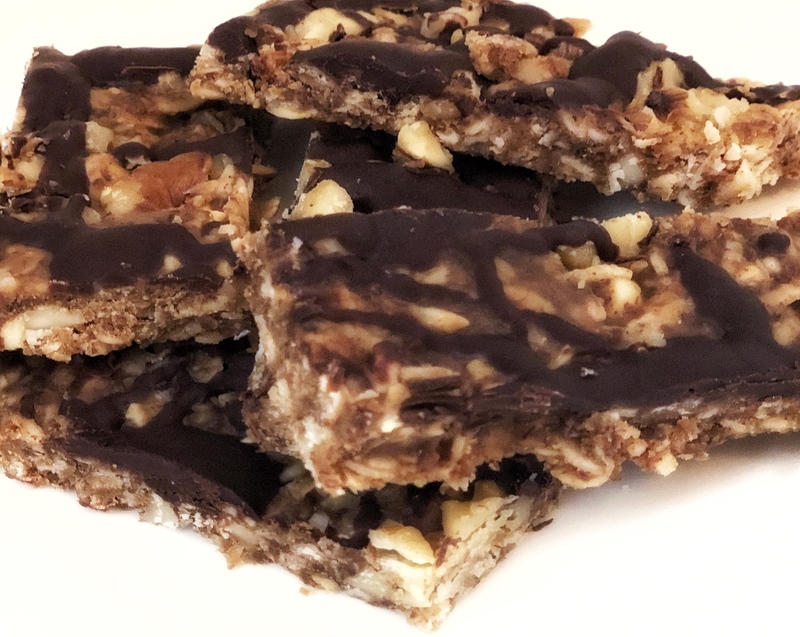 I found it in this recipe for No Bake Peanut Butter Granola Bars from Ambitious Kitchen. Bonus, each bar contains 7 grams of protein and a ton of healthy fat. Healthy fat seems like an oxymoron doesn’t it? Add peanut butter, coconut oil, honey, vanilla and cinnamon to a medium saucepan and place over low heat. Stir periodically until the mixture is smooth and creamy. Remove from heat and immediately stir in flaxseed meal, chia and oats. Fold in almonds and shredded coconut and stir until combined. Cover the bars with foil, and place bars in the fridge for 30 minutes-1 hour or until mixture has hardened. Remove bars from pan and cut into 8 granola bars anyway you’d like. Store bars in the fridge, either individually wrapped in plastic or in foil. Bars will last up to 1 week in the fridge. I hope this helps keep you out of your kids’ Halloween baskets!